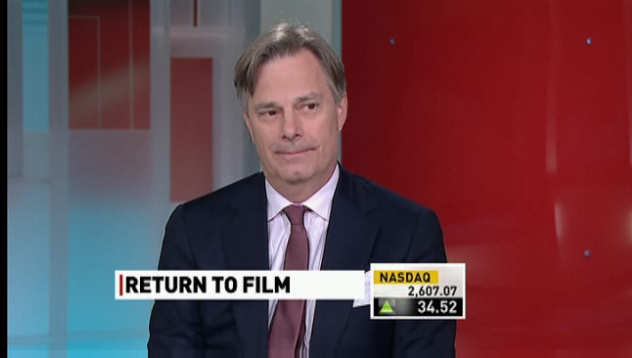 Whit Stillman was interviewed by Amanda Lang on CBC’s Lang and O’Leary Exchange , to coincide with the screening of Damsels in Distress at the Toronto International Film Festival 2011. They mainly discussed what it takes to fund and develop relatively low-budget movies. This is a transcript of that conversation, transcribed by Jonathan Takagi. Amanda Lang: That’s a clip from a film that showed at the Toronto International Film Festival this year called Damsels in Distress . It’s been thirteen years since the last film by the man who brought The Metropolitan , Barcelona and The Last Days of Disco in the 1990s. Whit Stillman is the writer and director of Damsels in Distress . Great to see you. AL: So, it was a long time in the making. Let’s start with how this film differs from your other films, if you feel it does. WS: Well this film is related to our other films, but it’s more funny, I think, and less realistic, it’s sort of a fantasy land. And we had a wonderful young cast, with Greta Gerwig, Adam Brody and a whole bunch of discoveries. AL: So, people outside, we have this voyeuristic tendency to know how long it took to put it together. So let’s start with, you write your own films, the script is very dialogue driven, let’s say that. If you don’t like the writing, you’re not going to like a Whit Stillman film. AL: Most people love the writing. How long did it take to write this one? WS: It really wasn’t that long. I was working on other things that didn’t happen. I was based in Europe, trying to make dramas out of London, and that didn’t go ahead. I came back and pitched the idea to the people who backed my other films, and it didn’t really take that long to do the script. It sort of sailed along. AL: And so, once you get the script together, do you already have your financing in place, do you look for financing once you have it? You’re kind of already established, so it’s probably easier for you to get the money behind you. WS: No, that’s the surprising thing. Our other films have been successful in a small way. They’ve all made money really. I was just stumped with how hard it was to get back in for a film. In this case, I said to them, “Let’s just make this cheaply. Let’s make it like we did Metropolitan , the first film.” And they said, “We can find people to write those checks right away.” We didn’t want to go through that whole system of star casting and presales and equity financing, that almost never works, and when it does, it takes forever. AL: What we heard last year at TIFF, Toronto Film Festival, is that it felt different, in terms of the deals that got done, how quickly, how easily, that it was sort of slower, more friction. Does it still feel that way, is that part of what you’re describing? WS: Well, we kind of had an indie film bubble, in the ’90s, and it’s been bursting for 10 years. And things started to recover at last year’s TIFF. And I think there was a good Sundance and Cannes too. And now the feel, I think it’s slowing down again. It’s really a buyer’s market. If someone wanted to buy up a lot of good product, they could do it now. AL: How important is a film festival? You just closed Venice, which is a pretty prestigious place to be, you’re here at the TIFF film festival. How much does that matter, from a money-making point of view? WS: It’s extremely important, it’s most vital for the films that haven’t been sold. And if they can have a good screening here, and get a bidding situation, then they can be in a very fairable spot. There are so many good films, and so few buyers, normally the buyers can set the deals. AL: What’s the distribution model like these days? Can you still make a lot of money? Does it matter that you’re in thousands of theaters, hundreds of theaters? Are you still making money if it’s picked up at all? How does that work? WS: Yes, a lot of money can be made, but people have to be very serious about the budgets. Because it’s exponential, the amount of money that has to be earned to kind of cover the budget. It’s hard to get that money back into the producer’s hands. AL: We were talking, across the arts, music is the most obvious place, a whole new paradigm, of how people consume it, how they buy it, the willingness to steal it, even, which is sort of a shocking new aspect of culture. Has it come to films that way? I mean, we know that Netflix is there, does it change the way you think about selling stuff? WS: Yes, I think the last four years have been very bad for that. The same thing that happened to the music industry is happening to the film industry now. There has to be some cure to the piracy problem. There has to be some way of metering, the way people watch. Netflix has been good, if everything could be like Netflix, that’d be great. AL: Because at least we’re paying. WS: No, we’re on Netflix. For my first film, Metropolitan , because we made it for so little, the Netflix money is fantastic, and the problem is that, if you spend anything on the film, it’s very hard to get it back, because the prices paid now are terrible. And one of the last buyers are pay TV, and if Netflix kills pay TV, then we’re in a fine fix. AL: Is that right? When you say, “keep the budgets small”, is there a dollar figure on that? Is there a size of movie that makes sense? WS: You really have to think all the time, like what is the potential for the film? And it’s amazing, the good films being made for very little money now. It has to be done that way, really. AL: That’s kind of the holy grail, I remember a few years back Disney saying, “That’s it, no more blockbusters, we’re going to spend, I forget what it was, $10 million on our films, no more, some will make it, some won’t, and yet, the blockbusters still do make a ton of money right, the huge budget films. WS: They reversed course, which is actually opening up an arena for independent films. So the studios are now doing so-called “tentpole films”, very expensive films, and the middle range is completely left. That’s why a film like The King’s Speech can be so big. AL: You have, in this movie, some pretty decent start power, is that hard to do? I mean, when everybody’s got a brand? My chocolate labrador has a brand. Is it hard to kind of get people to agree to do projects? WS: I don’t think so, no. I think people feel there’s so little good work, that there’s an over-supply of talent for the number of jobs available. AL: If you could do anything – you write films, you turn them into movies, your friends are happy that you do that. If you could do anything, what would the job be? WS: Novels [laughing]. No really, it’s such a hard thing. I’ve just finished a film, and you’re so beaten up after that. I want to go ahead and write and direct. AL: It’s like asking a woman who’s just had a baby when her next one’s going to be? AL: Well, my apologies. I can’t wait to see the film. It’s great to have you here.